Lucy Ravitch, author and founder of Kids Menu Books, loves to make math fun for all kids. Since she was young, she loved to play with numbers. She hopes to instill a love of learning through play. Lucy lives in Southern California with her husband and five kids. She blogs at kidsmathteacher.com and maintains kidsmenubooks.com. Lucy took The Pancake Menu onto Good Morning America in April of 2015 on a Shark Tank Segment and continues to take the book to schools. In addition to winning a Bronze Reader's Favorite award she also won a Bronze Independent Publishers Award too! I confess, I am a mom and I do not know how to make pancakes. So when I saw Lucy Ravitch’s book, The Pancake Menu: Menu & Cookbook Hands-on Math Fun, I grabbed it in hopes of learning. I was not disappointed and am happy to say I have a better idea of how to make pancakes now. 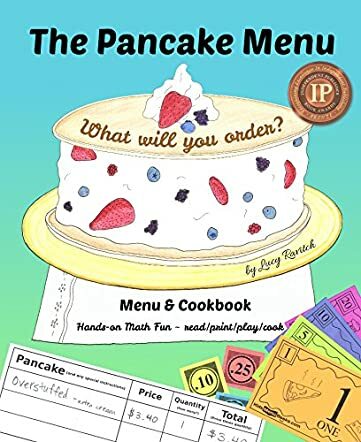 The Pancake Menu starts off with colorful pictures of all the recipes in the book. On these pictures are also prices that you can use to teach your children math when you order the pancakes. In the back of the book are the cooking tips and actual recipes for each item that was pictured. Ravitch has a bunch of pancake recipes in this book that I have never heard of. Such as Flying Saucer Pancakes and Overstuffed Pancakes. One thing is that they all look fun to make. The recipe I look forward to trying the most is the Alphabet Pancakes. Making letters and names would be fun. The hardest part of this recipe looks to be learning how to write mirror image. But thanks to Ravitch’s helpful tip about writing the letters out on paper, she makes me feel confident that I could do it. The Pancake Menu is the first book in the Kids Menu Book series. I think a cookbook for kids is a great idea. It would even be helpful to adults like me who are still earning how to cook. I look forward to reading more books in the Kids Menu Book series. I'm so glad Jessyca (my reviewer) enjoyed the book! I have been getting a lot of great responses from kids and parents alike how much they love The Pancake Menu! I was so excited to see that it just won the Bronze in Children's Concept Books for the Readers Favorite 2016 book awards!